Who’s to say the man in the advert isn’t Santa Claus? He’s got a beard. Granted, it is black rather than snowy white. Perhaps, it’s meant to be Saint Nick as a young man. But, you may argue, there are children; Santa doesn’t have children. [What do you expect from someone who only comes once a year? - Ed.] Ahem. How do you know he hasn’t got kids? Maybe old man Santa’s children have simply grown up and moved out. Couldn’t put up with the smell of reindeer poo, I shouldn’t wonder. My criticism of the advert is more that anybody could possibly suggest that Father Christmas aka Santa Claus aka Saint Nicholas doesn’t bring children’s presents. Regular readers of this august blog know fine well that Santa Claus is alive and well and delivering presents to kids every Christmas eve. How do you know? Evidence. You remember. You do. Last year. I told you. I did. I told you how Santa recorded his voice on a brand new tape recorder. I told you how I attempted to film him delivering presents but ended up with a film of them just magically appearing. I told you how years later my son tried the same experiment with the self same result. how can anyone argue with facts like that? In case you haven’t got any idea what I am talking about, see Week 20 - The Grambler proves Santa Claus is real . Were any famous or notorious people born on the 18th of November? Of course. Here are some I’ve even heard of. Louis Daguerre 1787 (Photography pioneer. ), W. S. Gilbert 1836 (Librettist. They can’t touch you for it. ), Wyndham Lewis 1882 (Writer and painter. ), Eugene Ormandy 1899 (Violinist and conductor. ), George Gallup 1901 (Pollster. ), Alec Issigonis 1906 (Designed the Mini. [I thought that was Mary Quant. - Ed. ]), Johnny Mercer 1909 (Lyricist. First link of the week coming up. You'll recognise this. ), Hank Ballard 1927 (Singer and songwriter. He wrote this. ), Brenda Vaccaro 1939 (Jobbing actress. ), Linda Evans 1942 (Krystle Carrington. ), Chris Rainbow 1946 (Musician. Here’s a nice wee toon), Graham Parker 1950 (Singer and songwriter. Here he is with The Rumour), John Parr 1952 (Musician. Another clip vicar? Here is perhaps his most famous song. WARNING: be prepared for some seriously iffy hairstyles. ), Alan Moore 1953 (‘The best graphic novel writer in history’. Has also used the pseudonyms Curt Vile, Jill de Ray and Translucia Baboon. ), Kim Wilde 1960 (Singer. Here is her first hit. ), Steven Moffat 1961 (Doctor Who main man. ), Kirk Hammett 1962 (Geeetarist with Metallica. Here is an early toon he was involved in... Enter Sandman. ), Peter Schmeichel 1963 (Mad goalie. ), Nadia Sawalha 1964 (A loose woman. ), Owen Wilson 1968 (Lightning McQueen. ), Luke Chadwick 1980 (Footy bloke.) and Michael Dawson 1983 (Footy bloke.). How wonderful that you acknowledged the birthday of one of the true geniuses of music. Sir William Schenk Gilbert who, with composer Sir Arthur Sullivan, gave us some of the most memorable operas of the late nineteenth century. We both absolutely love everything they ever did. Here is a teaser for all your readers - What was Gilbert and Sullivan’s first internationally successful opera? After two weeks of no betting in a blog that was begun with the intention of gambling randomly (hence gramble), I think it is time we had a bit of a flutter (oh yes). What has the great and magnificent Grambler predicted will earn a bit of dosh this week? He/she/it’s done it again! Five matches from one division. I reckon there’s a glitch in the random number generating thingummy bob (I know all the technical jargon). Teaser time. Yay! Last week I asked you who scored a hat-trick when Germany beat Poland in their opening game of the 2014 World Cup finals tournament. Since it was referring to a fairly recent tournament, some of you may well have remembered that it was none other than Thomas Müller. His international career did not get off to a particularly memorable start, at least as far as one Argentinian legend was concerned. After debuting in a 1-0 friendly defeat to Argentina, Müller appeared for a post-match press conference at which opposition coach Diego Maradona mistook him for a ballboy. Maradona refused to give his press conference until Müller departed. What about a wee teaser for this week? Here’s a European Cup/Champions League question for you to ponder. Who are the only club to have won the European Cup/Champions League more times than they have won their domestic league title? One to ask down the pub, I reckon. And finally, Cyril? And finally Esther, I am indebted to a Mr W. Disney who, on this very day 89 years ago, released the first film in which his most famous cartoon character actually spoke... sort of. Made noises, more like. Any road up, it was old Walt himself who did the speaking or noise making; he provided the voice for Mickey Mouse and Mickey’s bit of crumpet, Minnie, in all films until 1946 when Jimmy MacDonald took over. 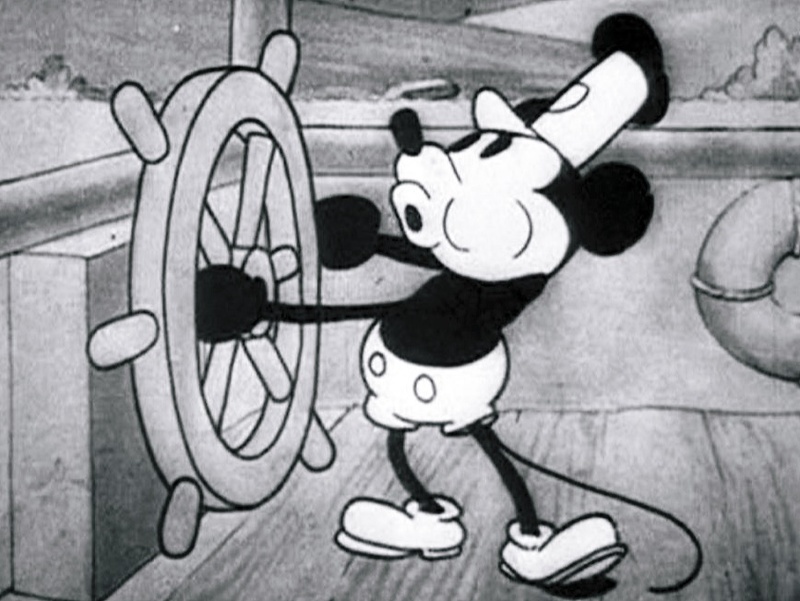 For some odd reason, the first Mickey film with sound, released on the 18th of November 1928, was called Steamboat Willie rather than Steamboat Mickey. I have no idea why. Whatever, it was a huge success and allowed Walt and his House of Mouse to become, possibly, the most successful film company in the good ol’ US of A. Incidentally, although Disney referred to this film as being the ‘birth’ of Mickey Mouse, the character had been seen twice before in the silent cartoons Plane Crazy and The Gallopin’ Gaucho. There you go; a bit of history to finish. What about a link? Indeed. Let’s end with a link to that very first sound cartoon. He doesn't look 89, does he?